TRASH & 7 SIMPLE FIND YOUR HOW DO I DISPOSE IT RECYCLING RULES FOR COLLECTION GET RID OF YOURSELF BASICS TRASH DAY DAY THIS? DO... ...pour fats, oils and grease (FOG) down your drain. It causes a buildup of sludge, which causes residential sewer backups. ...collect cooking oil in a sealed container and contact HHW for collection. See page 7. ...dispose of leaves and/or grass clippings into the street or storm drains. Yard waste clogs drains and leads to excessive algae growth in lakes and streams, killing aquatic life. ...use yard waste as mulch or put it in paper lawn bags for disposal in the CWD yard waste collection program. See page 7. ...drain swimming pools onto the ground or into storm drains. It increases chlorine levels in our lakes and streams, killing aquatic life. ...drain swimming pools into the residential sanitary sewer system found at all homes. ...flush or pour medications down your home drains or place them into storm drains. ...visit CityofAllen.org/HHWguidelines for disposal options. See someone breaking the rules? Call our reporting hotline at 214.509.4512 or visit CityofAllen.org/OnlineHelpDesk if you witness someone improperly disposing of materials in the city's sewer or wastewater system. Violators can be fined up to $2,000 each time they violate one of these city ordinances. Shrubs can't encroach over or above the back of the alley or curb. City ordinance requires residents to keep streets and alleys free of hanging branches and encroaching shrubs and plants. THE BASICS ABOUT TRASH IN ALLEN Community Waste Disposal (CWD) provides trash and recycling services for the City of Allen. The CWD Customer Service number is 972.392.9300, option 2. Please contact CWD for all trash and recycling issues. The North Texas Municipal Water District (NTMWD) provides trash disposal and composting of yard trimmings. See pages 7-8 for details. Verify Your Billing Residential trash customers are typically provided with one trash and one recycling cart; residents may have additional carts for an added fee. Please verify the number of trash and recycling carts on your utility bill and call the City of Allen at 214.509.4560 if you notice any discrepancies. Collection Schedules Trash and yard trimmings are collected weekly. Recycling is collected every other week. Bulk waste and loose brush are collected once per month by appointment only. HHW (household hazardous waste/chemicals) is collected by appointment. See page 7. Senior Discount Program Residents age 65 and older may be eligible for a 20% waste service discount. Pick up an application at the Utility Billing window at Allen City Hall (305 Century Parkway) or apply online at CityofAllen.org/UtilityBilling. Set it out by 7 a.m.
All trash and recycling carts, yard trimmings, bulky waste and household hazardous waste (HHW) must be set out by 7 a.m. on the designated collection day. Customers who miss the deadline and want to schedule an alternate pickup may incur a separate charge. No carts, yard waste, HHW or bulky items may be set out earlier than 6 p.m. the night before pickup. Carts damaged or broken in the normal course of service are repaired and replaced by CWD at no charge. Call 927.392.9300, option 2 to request this service. DIY Options for Trash In addition to regular pickups, residents may take advantage of do-it-yourself options for disposing of trash, recycling and yard waste. See page 10. Call CWD within 24 hours of your missed pickup in order to schedule service for later that week. Misplaced Carts Trash and recycling carts are owned by CWD and may not be moved to a different address. If carts are misplaced or lost, residents must pay for replacements. Residents are encouraged to write their address on carts with permanent marker or spray paint, in order to easily identify them. Kick it to the Curb! FACE HANDLES TOWARD THE HOUSE Place trash and recycling carts with handles facing the house and lids opening to the alley or street side. GIVE CARTS 2 FEET OF SPACE Automated control arms need at least two feet on all sides of your carts in order to pick them up. Keep trash & recycling carts at least two feet apart, and at least two feet from fences, cars, gates, gas meters, etc. DO place your trash in securely-tied plastic bags. Using bags prevents litter and spilled trash. DO NOT allow trash to overflow. All bags must fit inside the cart with the lid closed. SET IT OUT BY 7 A.M. All trash and recycling carts, yard trimmings, bulky waste and household chemicals (HHW) must be set out by 7 a.m. Missed your collection? You can schedule return service for later in the week for a $45 charge. DON’T DUMP UNLAWFUL DEBRIS OR SUBSTANCES IN YOUR CART It’s unlawful to put construction materials, hot ashes, oil, dry cleaning chemicals, paint, pool chemicals, car batteries, dead animals over 10 lbs, yard waste (including tree stumps) and any hazardous substances into the carts. See pages 7-8 for details on how to request free household chemical pickup or to find other options for disposal. BAG (SOME) RECYCLABLES Recyclables may be placed loose in your cart. However, DO NOT put loose, shredded paper in your cart. Instead, put it in securely tied, clear plastic bags to reduce litter. DON’T PLACE ITEMS OUTSIDE YOUR CART Use our DIY disposal options (page 10) to manage extra trash. Any trash left on top of or beside the cart will not be collected. Recycling Pickup Days Recycling pick-up occurs every other week on the same day as trash pick-up. Refer to the map on the next page to determine if you fall under Recycling Cycle A or B. Allen hosts two citywide events to collect items not accepted in Allen's recycling program: Allen Recycles Day and The Great American Cleanup. Find more information on CityofAllen.org and in your water utility bill in March & October. *On designated holidays, trash and recycling collection slides one day. See page 6 for details. Call CWD at 972.392.9300, option 2 to schedule loose brush collection or bulky trash pickup. This is also the number to call for missed trash collection or damaged carts. If severe weather will impact your trash collection, the information will be shared on CityofAllen.org, CommunityWasteDisposal.com, and on Allen City Television (ACTV) available on Time Warner Channel 16, Frontier Channel 15 and AT&T U-verse Channel 99. Weekly, on your assigned trash day. See the map on pages 5-6 to find your route. Set carts at the curb by 7 a.m., but no earlier than 6 p.m. the night before pickup. Every other week, on the same day as your trash day. Find your assigned day on pages 5-6. Set carts at the curb by 7 a.m.
Pickup of household chemicals (also known as household hazardous waste, or HHW) can be scheduled twice per year. Residents are limited to 5 gallons or less per pickup. Weekly, on your assigned trash day. See the map on pages 5-6 to find your route. Place items at your trash collection point, at least two feet away from carts. Monthly, based on trash day. You donâ&#x20AC;&#x2122;t need to! However, if you miss collection due to setting out carts late, you may schedule a pickup later in the week for a $45 fee by calling 972.392.9300, option 2. Household trash, including spoiled food, smelly diapers, unmatched socks, broken wine glasses, spent pens, dead alkaline batteries and burnedout incandescent lightbulbs. Construction materials, hot ashes, oil, cleaning chemicals, paint, pool chemicals, car batteries, dead animals over 10 lbs., yard waste (including tree stumps), any liquid or hazardous substances. Recycling service runs automatically on your assigned trash day. Glass bottles and jars, cereal/ soda boxes, newspapers, magazines, soda bottles, yogurt containers, milk cartons, shampoo bottles, tin/steel and aluminum cans. See page 9. Aluminum foil & baking dishes; plastic bags; Styrofoam or #6 plastics; wire hangers; ceramics, drinking glasses and light bulbs; plastic toys; yard waste & kitchen scraps; trash; HHW. Requests for pickup must be received by noon on the day before your assigned collection. Call CWD at 972.392.9300 (option 2) to schedule. Construction/remodeling materials, fence materials, tree limbs/trunks, yard trimmings, dead animals, hazardous waste/household chemicals, rugs or carpets larger than 6 feet in any dimension, boxes or bagged trash. Schedule a collection at CityofAllen.org/HHW or by calling 214.509.3100. Cooking oil, cleaning products, pool chemicals, pesticides, paints/ primers, automotive fluid, lighter fluid, soaps/shampoos, oil filters, kerosene, button/auto/ rechargable batteries. Keep liquids in original or labeled containers. Arsenic, asbestos, biohazards, alkaline batteries, expired medication, medical waste, propane or helium tanks, ammunition/explosives/fireworks**, unlabeled chemicals. Do not mix liquids. Up to 7 bundles or 15 bags of yard waste is collected automatically on your assigned trash day. Grass clippings, leaves, and plant material placed in biodegradable paper lawn bags; bundled branches no more than 4 inches in diameter (see page 9); empty cardboard boxes tied with biodegradable twine. Brick, rock, gravel, concrete, dirt, sod, fence panels, tree trunks, root balls, tree branches larger than 4 inches in diameter, plastic bags of yard waste. See loose brush pickup (below) for large quantities of loose brush. Up to 3 cubic yards (about the size of three washing machines placed side-by-side) of tree and brush trimmings. Branches must be no longer than 6 feet in length. Tree debris cut by commercial contractors. Residents must negotiate removal fees when paying a contractor to trim or remove trees. *Freon must be removed and certified with a tag on the appliance. Unbagged brush trimmings tied with biodegradable twine or rope. Bundles may be up to 4 ft. long and weigh up to 40 lbs. WHEN YOU CAN’T WAIT UNTIL TRASH DAY Residents may dispose of up to two loads of household trash and/or yard waste per month at any North Texas Municipal Water District (NTMWD) facility at no charge. 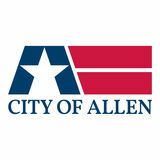 Residents must show a current City of Allen water bill and current Texas drivers license with matching address. Loads must arrive in a car, pickup truck or flat-bed rental truck available at home improvement stores. No commercial loads, stake bed trucks or box trucks are permitted. Permitted items include household garbage, packing material, home and lawn furniture, mattresses and box springs, grills (no propane tanks), lawn mowers (oil and gas removed), appliances and rolled rugs and carpet pads less than 6’ in any dimension. Some facilities also accept specialized trash or yard waste items. Before planning a trip, consult the list below or visit NTMWD.com/facilities. Review the full acceptable waste policy at NTMWD.com/documents/acceptable-waste-policy. SPECIAL ITEMS ACCEPTED •	Yard trimmings and tree limbs •	Lumber (untreated, unstained, unpainted; no nails or metal brackets) •	Bagged leaves and grass clippings •	Pallets (clean, unstained) •	Cardboard Compost may be purchased and delivered from Texas Pure Products (texaspureproducts.com). See back cover for coupon. Sheet rock, brick, rock, gravel, concrete, dirt, sod, carpet and fence panels must be taken to this facility and may incur a disposal fee to be paid by resident. No uncovered/unsecured loads will be accepted.